There is an "urgent need" for a prison in north Wales which needs to be prioritised by the UK government, a committee of Welsh MPs has said. It follows the rejection of a site in Caernarfon, Gwynedd, as "not suitable". Alternative sites are being considered in Wales and England but the MPs on the Welsh Affairs Committee have said this is a "backward step" in their report. The Prison Service said sites in north Wales, London, the north west and west Yorkshire were still being looked at. In 2009, sites in Merthyr Tydfil, Cwmbran, Wrexham and Caernarfon were short-listed as possible prison sites, before Caernarfon was eventually chosen. 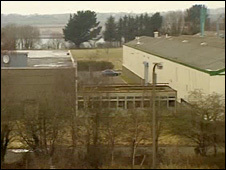 However, plans to build a prison at the former car components plant best known as Ferodo - and later as Dynamex - were withdrawn because Justice Minister Maria Eagle said it was "not suitable for prison development". It was estimated the site could have created 700 jobs. In a report published on Wednesday, the Welsh Affairs Committee says all four prisons in Wales are in the south of the country, and there is a lack of space for young people and women. It says north Wales should "not be denied a prison it so badly needs because of the Ministry of Justice's policy to build facilities of a certain size only". The committee is calling on the Welsh Assembly Government to work with MPs and local authorities to identify suitable sites. Committee chairman, Dr Hywel Francis MP, said: "The Ministry of Justice is failing to tackle the ongoing problem of the lack of prison facilities in north Wales. "No north Welsh prisoners are in a Welsh prison and there is a shortfall of around 800 places for prisoners in north Wales. "The announcement that a prison would be built near Caernarfon raised expectations in the area and it is very disappointing that the site was not ultimately found to be suitable." Dr Francis said the UK government's "lack of progress is of significant concern to the committee". He added: "New facilities would not only bring positive economic benefits to local communities but would also bring relief to the family, friends, support workers and probation officers who require improved access to prisoners. "We urge the government to prioritise its search for a suitable prison site in north Wales." A Prison Service spokesperson said: "The Government continues its search for sites suitable for 1,500-place prisons. "The search is focused on our priority areas of London, north Wales, the north west and west Yorkshire. Some have been suggested by local authorities or members of the public. "After carrying out a suitability assessment of the sites we will publish a shortlist of preferred sites later this year. "The Government is committed to providing more prison places to ensure that the most dangerous, serious and persistent offenders are locked up, and plan to provide 96,000 places by 2014. "This includes plans for new 1,500-place prisons." Last month, Gwynedd council discussed the possibility of a prison at a former army camp at Tonfannau near Dolgellau, which it said was being "seriously considered" as a potential site.